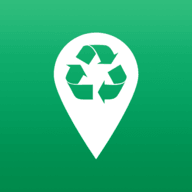 A combination of a far-reaching single-stream curbside recycling program and many drop-off recycling locations makes it easy to recycle in Louisville. Louisville (pop.597,337), a city-county with an increasingly urban slant, is still at its heart a traditional Southern U.S. city. The merging of city government into a city-county government known as the Louisville-Jefferson County Metro Government in 2000 brought changes to the recycling program, with curbside service now available to the “Louisville Urban Services District.” All single-family homes and residential buildings with eight units or fewer are eligible for curbside recycling pick-up. The city-county Division of Solid Waste provides residents with 18-gallon orange plastic single-stream recycling containers at no charge. Extra bins or replacement bins cost $10. Household containers such as milk jugs, cups, squeeze bottles, clear food packaging, soft drink, laundry and dishwashing detergent, margarine and whipped topping tubs, bottles and jars marked #1 through #7 with the recycling symbol are accepted in the program. Clean thoroughly and leave labels and lids on. Flatten to save space if possible. NO medical waste such as syringes; motor oil or antifreeze jugs, plastic bags or buckets, pumps or sprayers, paint containers or plastic cutlery; plastic or styrofoam packing material such as peanuts. Styrofoam cups, plates and food containers are also NOT accepted. Metals Including steel/tin cans such as soup, vegetable or pet food (rinse and put lids inside); empty aerosol cans (remove plastic lids); clean, used aluminum foil; disposable roasting, pie and cake pans; and beverage cans and clean aluminum food containers (flatten to save space if possible). NO coat hangers, paint cans or medical waste such as needles. Glass Food and drink bottles and jars (clear, brown, green, blue). NO window glass, mirrors, light bulbs, drinking glasses/mugs, oven/cooking glassware or pottery. Curbside pick-up occurs weekly. Recycling bins must be placed curbside by 6 a.m. on the day of pick-up, but no earlier than 4 p.m. the day prior. Though hazardous items are not acceptable for placement curbside, Louisville and its surrounding areas offer ample drop-off opportunities. Items such as batteries (AA, AAA, C and D); antifreeze; motor oil; automotive, boat and motorcycle batteries; inkjet and laser toner cartridges; DVDs and CDs; and floppy disks are all accepted at any of the area’s staffed drop-off locations. While Styrofoam is not accepted curbside or city-county-sponsored drop-off locations, Foam Fabricators, Inc. in neighboring New Albany, IN, will accept clean, bagged Styrofoam. Residents can drop off smaller amounts during regular business hours or call ahead for an appointment for larger quantities. Louisville’s CyberCycle e-waste collection program accepts a large amount of electronics at its drop-off location at the Louisville Waste Reduction Center (636 Meriweather Ave.) from 8 a.m. to 5 p.m. Tuesdays through Fridays and 8 a.m. to 3 p.m. on Saturdays. TVs, microwaves, computers, scanners, printers, monitors, tape and disk drives, electronic-gaming systems, VCRs, CD players, digital cameras, copiers, cell phones, CDs and floppy disks are all accepted. Commercial-sized copiers, servers and printers will be considered as business equipment and charged accordingly. Residents can dispose of three of the above items per visit for free. Visit the Louisville, KY, website for more recycling program info.